If you are going to be purchasing rowing machines then it would be a good idea to check which models are popular in the UK. This would enable you to read reviews about them and go for the one that would fall within your budget while enjoying good ratings from previous buyers. Below are top ten rowing machines which you can get further details about as well as read their reviews by following the given links. The indoor rowing machine has evolved in recent years, its manufacturers have made great efforts to create the best elegant and highly refined equipment, specially designed to improve the health of your heart and strengthen your back and arm muscles. Having a Rowing Machine in your home can be the boost you need to start shaping the figure you want so much and also improve the level of your health in a safe and low impact way. There are different products in the market to choose from, but how to know which is the best? The sliding of the seat on the rail, the size that the product can cover, the amount of resistance that you can apply in your workouts, all these are details that must be taken into account when choosing a rowing machine. All the machines shown below are designed to be used by experts and beginners. If you want to make a change in your life and start to look better and feel better, a rowing machine is what you need, you can start exercising without leaving your home, strengthening a large number of muscles and improving your aerobic capacity. 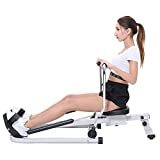 If you want a comfortable and safe workout, the Body Sculpture Rowe and Gym is what you need, with a robust tubular steel frame, this rowing machine gives you total safety and comfort to increase the level and duration of your workouts. This product has characteristics such as its adjustable resistance and foot plates with adjustable straps that make it an amazing product to have in the home. In addition to this, the computer screen gives you a clear view of the calories burned, the time and the count. 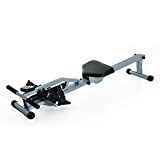 This rowing machine you can get at an affordable price is an excellent product to increase the size of your muscles, you can strengthen your arms, shoulders, abs, and chest. In addition, thanks to its adjustable resistance you can increase the intensity of your workouts as time passes. This is an impressive product that you can buy in the market for a reasonable price. It gives you comfort at the time of your workouts thanks to its adjustable platforms offering you a greater support of the ankles. Your LED monitor allows you to observe the time of your workouts, counting and calories burned. Take your cardiovascular workouts to a higher level with the ISE Home Rowing Machine SY15001-GY, strengthen your thighs, glutes, core, arms, and back. With its 8 levels, this hydraulic resistance rowing machine is ideal for keeping you healthy and fit. This product is an affordable solution for your home gym. With 10 levels of magnetic resistance, the XS Sports R010 offers you a demanding workout that will give you results in no time. This is a product made for the home, it is very compact and foldable so that you can store it anywhere in your house, in addition to having built-in wheels to facilitate its mobilization. This product has evolved and left behind the rowing machines that use an elastic system, thanks to its advanced belt transmission system you can have an effective training and with a high degree of difficulty. Also with the purchase of this product, you will have 12 months warranty included. Skandika Fitness has done an excellent job with this new Rowing Machine, specially designed to develop your body, improve health and well-being in the comfort of your home. 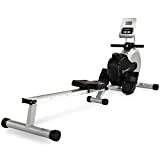 Regatta Poseidon Rowing Machine gives you a workout of up to 85% of your body muscles, simultaneously strengthening the muscles of the legs, arms, core, and back. This impressive machine has two additional handles for you to perform a variety of standing exercises, and in this way adapt your workouts to your needs. The exercises you can perform with this rowing machine, will not only strengthen your muscles but also burn calories and increase your aerobic capacity. It also has an integrated screen where you can see relevant data that will help you set your goals and overcome them, the monitor shows the training time, speed blows, and calories burned. Advanced belt driving system provides rapid engagement for an excellent training result. The inbuilt wheels allow this item to be easily transported. Compact and foldable. Maximum User Weight is 100kg. The Rowing Machine R200 gives you an elite workout in your home. Its advanced belt driving system gives you a better quality of movement when you train, and its 10 levels of magnetic resistance will make your training days the most intense you have ever experienced. The R200 has a smooth sliding mechanism, which makes it a silent and top quality rowing machine so you can paddle to your full capacity. Their handlebars are comfortable thanks to the fact that they are padded with foam and their non-slip rubber cover so as not to cause irritation on their hands. On the other hand, its storage is simple thanks to the fact that it can be folded and unfolded very easily, just like transporting it is easy thanks to its integrated wheels. If you are looking for a practical product that gives you quality training, the Viavito Sumi Rowing Machine is what you need, thanks to its gentle rowing action and it’s 7 kg steering wheel you can enjoy an intense and comfortable workout at the same time. Strengthen the lower, upper and core muscle groups with the 10 magnetic resistance levels, you can control them manually and thus have total control over the intensity of your workouts. Thanks to its seat and its large pedals, you will have an ergonomic space to perform your workouts, in addition, the LCD screen shows you live all the information you need to see your progress, you can view the time, calories and hits per minute. The Marcy RM413 Rowing Machine offers a full body workout thanks to its magnetic resistance. You can create workout routines for strengthening and aerobic capacity thanks to the 8 levels of resistance offered by this machine. 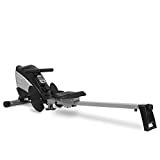 It does not matter if you are a beginner or an expert, this rowing machine is designed to be used by anyone with any type of physical capacity. Its large foam seat pad has wheels so that the sliding on the aluminum rail is smooth and uninterrupted. In addition, its wheels on the front make it easy to transport and it is totally foldable so you can store it anywhere in your home. The high-quality and quiet magnetic braking system operates with approx. 8 kg flywheel mass. Control resistance in 8 levels of intensity via computer. The training computer with LCD display provides all important data such as total number of strokes, approx. energy and calorie consumption, stroke frequency, time, pulse and distance. Computer integrated pulse receiver for 5 kHz chest straps (recommendation for 5 kHz chest strap: SP-HRM-BLE-400). Floor level adjustment - Ball bearing rowing-seat - High-quality aluminium roller rails - Max. user weight 150 kg - Dimensions approx. 190 x 51 x 77 cm - Folded approx. 95 x 51 x 122 cm (LxWxH). The safety of the rower has been tested according to EN ISO 20957-1, EN 957-7. If you are an enthusiast of intense training and are looking for a machine that challenges your abilities, the Sportplus Indoor Rowing Machine is what you are looking for. This innovative machine offers you 24 levels of resistance which you can control through the computer. 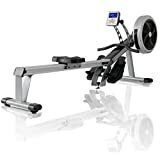 With this rowing machine, you will have a strength training, endurance and aerobic capacity, in addition, you will be able to observe all the progress thanks to its screen where you will see the training time, the distance, beats per minute, energy and calorie consumption and the heart rate. Robust air rowing machine: ideal for gym quality strength & endurance training. Available in silver or black. 16 levels of resistance & 8 training programs. Heart rate controlled options. Reinforced aluminium frame gives a stable rowing experience for users up to 130kg (20 stone). Easy fold system & transportation wheels allow this rowing machine to be folded away with ease. Buy this rowing machine with confidence: 2 year in home repair warranty, including all parts and labour. Are you looking for a machine that gives intensity to your workouts in your home gym? The rowing machine JTX Freedom has 16 levels of resistance thanks to the JTX DualTorque which combines the air flow and electromagnetic resistance to offer resistance throughout the movement path. In addition, it has 8 pre-programmed workouts which you can select on the computer according to your physical capacity and objectives, among these programs include Interval training, hill profile and target heart rate options, where you set the heart rate to which You want to arrive and the rowing machine will automatically adjust to maintain the resistance at your optimal heart rate. It does not matter if you are a novice or an expert, this machine is designed so that anyone can use it. Indoor rowing is an effective full-body, low-impact workout. Flywheel design minimises noise while maximising a smooth feel. Includes the Performance Monitor 5, giving you accurate, comparable data for every row. Adjustable monitor arm. Easily separates into two pieces for storage. Caster wheels make it mobile. Requires footprint of 274 cm x 122 cm; 227kg capacity; 5-year frame warranty. This is the best rowing machine you can find in the market, the Concept2 Model D Indoor Rower is the best selling rowing machine in the world thanks to its effectiveness in improving aerobic capacity and muscle strengthening. One of its most outstanding features is the performance monitor 5, this allows you to track important data for your training such as distance, speed, pace, calories burned and watts. It also has an integrated menu very easy to use, where you can find a variety of functions, such as pre-set workouts, games and multiple languages. When you enter the rowing machine, the first thing you want to do is adjust your feet. You want the straps to be just over the midline of your shoelace as you tighten, and you want to make sure as you go back, the straps are tight. As you come back, you’re pushing with your heels and you want to make sure that the straps are coming loose. Now two things to remember when you start to row is, legs->arms, arms->legs. What you want to do is to grab your handle and make sure that it’s set up at the proper resistance that you need it to be. A lot of people will have a rounded back like a cat like you’re protecting something in an alley. What you want to do is make sure your chest is up, you’re squeezing that lower back and keeping your core tight, your arms are straight, your arms should not bend until you reach all the way back. So what is meant by the legs-arms, arms-legs is, you start with your legs exploding back, as soon as the handle passes your knees, that is when your arms come into play. So what you want to do is, make sure your chest is up, your back is flat, armor straight, you’re going to explode first with your legs then your arms. Once your legs are straight, the weight should be where your knees are. Arms explode back, as your arms come back, you want to make sure you’re keeping your elbows in. The handle comes about midsection, you don’t want it to appear by your face. You don’t want it to be by your belly button. Keep it about midsection, elbows in, not flailing out, keep it in, squeezing your shoulder blades together at the back. So as you come forward, you’re going to reverse that. So on your way back to your first starting motion, start with legs, go to arms. Now you’re going to reverse that, arms then legs. So, as you come forward, you’re going to come forward following the line that’s already been created for you by the stretched out strap. Straighten your arms making sure not to round your back, keeping your chest up, as soon as the bar passes your knees is when your legs come into play. So legs-.arms, arms->legs, you just do that in a nice smooth motion. Rowing machines are among the most powerful of exercise machines that you could use to strengthen both your arms and legs as well as your core and back however their main downside is that they are not cheap. One way that you could ensure you can buy a quality rower at a lower price than normal is by going for them when they are on sale. 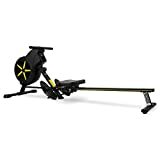 Below are top 10 most popular rowing machines on sale that you could invest your hard earned money in to ensure you get the best results from your workouts. 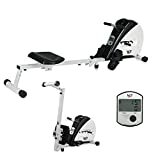 JLL IC300 Indoor Exercise Bike 2019, Cardio Workout, 18kg Flywheel Smooth Cycling, Adjustable Handlebars & Seat, Heart Rate Sensors & 6-Function Monitor + Pulse (Black). JLL Fitness Ltd - Misc.